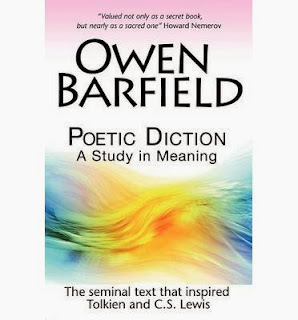 Over the perpetual evolution of human consciousness, which is stamping itself upon the transformation of language, the spirit of poetry hovers, forever unable to alight. It is only when we are lifted above that transformation, so that we behold it as present movement, that our startled souls feel the little pat and the throbbing, feathery warmth, which tell us that she has perched. It is only when we have risen from beholding the creature into beholding creation that our mortality catches for a moment the music of the turning spheres. Now that we have reached the end, for today, of our creative journey with the Inklings, can we begin, perhaps, to find a path to articulate what we have written so far? Is there a way in which the work that we have carried out in their company can be blended together to form what might, with time and luck, become a coherent, integrated whole? "Julie shuddered and flung her head back to the sky, letting the rain and light flow through and over her. She shook her hair, breathed in the city for the last time and slung her bag over her shoulder. The voice of Edinburgh Waverley cut through the mist once more: "Polmont, Falkirk High, Glasgow Queen Street."